This year, Ozzfest begins and ends with guitarist Zakk Wylde. His band Black Label Society opens the main stage of the festival, then after a couple of hours to catch his breath and kick back a few beers, he'll join metal godfather Ozzy Osbourne to close the show. Wylde will be joined by Ozzy bassist Robert Trujillo in his double duty. "Basically, we'll go out to open the main stage with Black Label and beat the living hell out of it," says Wylde. "Then, whatever's left, we'll come back with Ozzy and finish it off. Then we'll go backstage and have a few beers." That take-no-prisoners attitude is what drives Wylde and Black Label Society, whose previous albums have included "Sonic Brew," "Stronger than Death" and "Alcohol-Fueled Brewtality Live." Their latest, "1919 Eternal," was released in March. The album is not only filled with attitude, but also shows respect for the band's roots. It begins with the album's title. Originally called "Deathcore War Machine Eternal," Wylde says that title was nixed in the wake of Sept. 11. Instead, Wylde chose to honor his father, a World War II veteran, who was born in 1919. Wylde says his father embodies the ideals of Black Label Society, which go much deeper than the alcohol-fueled angst of many of the band's songs. "Thanks for instilling in me everything that you are - strength, determination, perseverance, family and honor," reads the dedication in the album cover. That, says Wylde, is what the band's attitude is all about. "He's where it all began," Wylde says. "He was on the beach at Normandy on D-Day. He's 82 years old, and he still works five nights a week. He's pretty much the architect of Black Label." Another man Wylde has a deep respect for is Ozzy, his partner in crime since the late 1980s. While Wylde enjoys singing, as well as the complete control he has over the Black Label Society product, he's not about to relinquish his position with Ozzy. "You know your role," he says. "It's just like when you go back to your parents' house, you don't kick your feet up on the furniture. This is Ozzy's house." 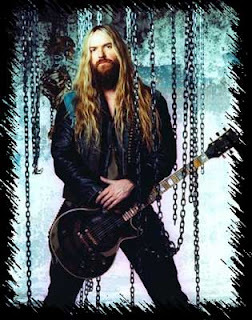 Though Wylde focuses on different aspects of the music when playing with Ozzy, he has no problem making the switch from his own music to working with Osbourne. "As far as I'm concerned, it all falls from the same tree," he says. "Have Ozzy sing on a Black Label record, and it's the new Ozzy album." And is life with the Osbournes as crazy as the MTV series? "Totally," Wylde says. "There's no acting there. They probably cut out some of the really insane stuff. He could have been a comedian if he hadn't decided to be the greatest frontman of all time." Aside from his music, Wylde is also pursuing some acting work. He made his debut in last year's "Rock Star," though he admits his role as a guitar player in a rock band wasn't a real stretch. "They said, `Zakk, just come down, play guitar all day, lift weights, drink beer and fire a 12-gauge shotgun," he says with a laugh. "And I said, `you're going to pay me for this?'" He's been approached about appearing on the HBO prison drama "Oz." There's nothing definite yet, but Wylde says he'd be interested. He's also looking into starting his own Black Label micro-brew, which he thinks will go over well with the band's fans. And he's about to begin breeding rottweillers. Wylde makes it clear that these extracurricular activities will always be secondary to his music - and don't expect that to take a commercial turn any time soon, either. "I'm really satisfied with what I'm doing," he says. "It's not like I'm selling 15 million copies, but I can make a living at what I'm doing - and I'm making the music I want to make." When Ozzfest ends next week, Wylde will head out for a short headlining tour with Black Label Society. Beyond that, he says it depends on how Ozzy wants to play it. "My wife just bought another house, so I'll probably be touring until I'm about 126. They'll just have to stuff me with new organs and send me back out," he jokes. "If Ozz wants to take a break, I'll keep touring with Black Label Society. If he wants to get going on another record, we'll do that. We'll just have to wait and see."